Celestron Super C8 Plus. Illustration courtesy of Celestron International. The Super C8 Plus was one of the last C8 models before the introduction of the first go-to mounts. It was mounted on a precision die-cast aluminum, swing through fork with a very accurate sidereal rate motor drive in the base. Manual slow motion controls and large setting circles were provided for both declination and right ascension. Celestron's Starbright coatings, newly introduced at that time, were available on the Super C8 Plus. A massive wedge and heavy-duty steel tripod completed the mounting system. An 8x50 right angle, illuminated reticle, finder scope; 1.25" visual back; 1.25" front surfaced mirror star diagonal; 7mm Orthoscopic ocular and a deluxe 26mm Plossl ocular were included in the package. The seamless aluminum optical tube was finished in high gloss black with matte black front and rear cells, fork mount and wedge. The tripod was also black. "Celestron" was stenciled in neat orange letters on both sides of the optical tube. It was a great looking scope, very professional. At the time, Celestron did all the grinding, polishing, figuring and coating of corrector lenses and mirrors in house. C8 optics were hand selected, hand figured and 100% quality controlled at several stages of manufacture. The optics were finished to 1/10th light wave accuracy. Celestron's metal fabrication shop turned out the optical tubes, forks and mounts. Everything was hand assembled on the premises, and every C8 received its final collimation and optical test by Celestron's head optician just before it was boxed for shipping. Celestron also tested all competitive scopes to ensure that the C8 was, literally, the best 8" SCT in the world. I was fortunate enough to have been invited to Torrance by Alan Hale for a tour of the Celestron plant (I was the manager of France Photo, a direct Celestron Dealer from the early 1980's through the middle 1990's), so I saw for myself the care that went into the fabrication and assembly of Celestron telescopes at that time. It was an impressive operation, casual but very dedicated. 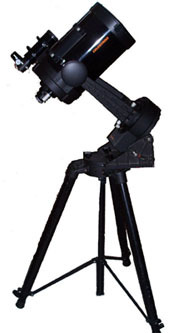 Celestron operated almost like an extended family and they produced very high quality telescopes. Celestron built CAT's from 90mm to 14" in clear aperture (all in their Torrance plant), but it was the C8, an 8" SCT, that had made Celestron's reputation and it remained their signature product. The Super C8 Plus was the best C8 that Celestron could build and it was the flagship of their line. Mirror coatings- Aluminum silver with optional Starbright silver coatings for both primary and secondary mirror. Star diagonal - Mirror type, 1.25"
Setting circle diameter - RA 8" (driven), DEC 4.25"
Height (legs retracted) - 29"
Height (legs fully extended) - 51.5"
Area of base (footprint) with legs retracted - 424 sq. in. Area of base (footprint) with legs fully extended - 1032 sq. in. At somewhere around 50 pounds assembled, it was no lightweight. The C8 was enough hassle to set-up that I almost never used it for a "quick look" from my backyard. One exception was Halley's Comet, when the western Oregon fog and drizzle miraculously cleared for just long enough to see the famous visitor during the time of its nearest approach. I had about 15 minutes with the Super C8 before the fog and clouds closed in again and during that time I got my best look ever at Halley's. I wouldn't want a larger "portable" telescope. At least for me, the C8 marked the outer limit of portability. On the other hand, it was great for dedicated star parties. Its set-up time was much less than the larger, clumsier, C11 and C14. The Tripod 5/8 and wedge was a good mounting system. The Super C8's combination of light grasp, focal length and diffraction-limited optics made it a very good planetary scope, as well as an excellent deep sky scope. I had a full set of original (Vixen made) Celestron Plossl oculars, which included focal lengths from 7.5mm to 45mm. At one star party, we used the Super C8 Plus to find Pluto (magnitude 14) during that planet's nearest orbital approach to the earth, which is right at the C8's theoretical visual limit. It also provided the most impressive, high magnification, lunar views of any telescope I have ever owned. Ditto for resolving individual stars in the M13 globular cluster. Under favorable seeing conditions, the Super C8 Plus would perform to its rated stellar magnitude and Dawes limit. It would visibly out perform the equivalent Meade 8" SCT (its only real competition in the marketplace) and its drive and mounting systems were superior. It was a heck of a telescope. The Super C8 Plus was not perfect, of course, no telescope is. For one thing, its manual RA slow motion control should have been reduction geared, but was not. It would have been nice if the motor drive had been designed to run on 12 VDC instead of 110 VAC. A voltage inverter was required to operate the drive from a car battery. The 5/8 Tripod did not incorporate an ocular tray, which would have been a convenience. I live in a singlewide manufactured home where storage space is at a premium and the C8 was hard to accommodate. It was heavy enough that I strained my back almost every time I set it up. (Professional photographers always have bad backs, trashed from lugging around too much heavy equipment.) For these reasons, I eventually sold my Super C8 Plus in favor of a smaller telescope. I wish now that I had found a way to keep the Super C8 Plus. It was an American made classic and I have little patience for the go-to mounted scopes that have replaced it. Copyright 2009, 2016 by chuckhawks.com. All rights reserved.